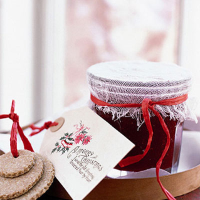 This spicy preserve fills several small jars, making it perfect for a Christmas gift. It will keep for up to a month. Store in the fridge once the jars are opened. Roughly chop the apples but don’t peel or core them as the fruits will be strained after cooking. Put the apples, cranberries, juice and chillies in a large saucepan. Bring to the boil, cover with a lid and reduce the heat. Cook gently for about 20 minutes until soft and pulpy. Press the mixture through a sieve, extracting as much pulp as possible. Return to the cleaned pan with the sugar. Cook over a gentle heat until the sugar has dissolved. Cook for a further 15 minutes, stirring frequently, until the mixture is thick and pulpy. Ladle into sterilised jars. Cover and label. For the oatcakes, preheat the oven to 170°C, gas mark 3. Grease a large baking sheet. Put the flour, oatmeal and salt in a food processor. Add the butter and blend until the mixture starts to come together. Then add about 4-5 tsp water to make a firm dough. Roll out thinly on a lightly floured surface. Cut out 6cm rounds using a cookie cutter. Transfer to the baking sheet. Re-roll the trimmings to make extra biscuits. Bake for about 30 minutes until crisp and pale golden. Cool on a wire rack before wrapping.